The days of summer are upon us, long, warm and sticky. The school children are out and the neighborhood is alive with children's voices during the week. The hose comes out and drenches everyone and it's all okay because it's summer. The evenings are so long and pleasant that we often find ourselves astonished by how late it is yet how high the sun is. The strawberries are here, sweet and ripe for eating, the raspberries are coming. Blueberries are not too far off. The Farmer's Market is gorgeous with greens, lettuce, spinach, kale, spring onions with red bulbs. 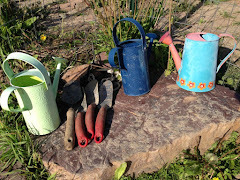 The garden is finally dry and beckoning, "plant me now before it's too late!" :: grateful to have a new fully functioning computer to work on! :: thankful for the inspiration! :: grateful for this most amazing online community! :: giving up the search for my camera to add photos to this post! Hi Lisa, I also feel inspired to do more that I can. I have so much energy and passion - but there is just not enough time in the day. 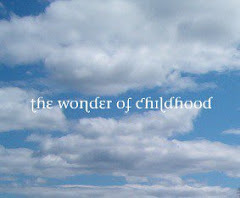 I am loving The Wonder of Childhood.